1. Preheat the oven to 180°C, gas mark 4. 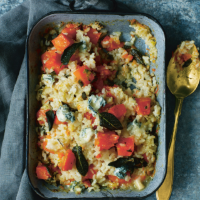 Place the butternut in a 2.5-litre ovenproof dish, drizzle with oil and roast for 15 minutes. 2. Meanwhile, melt the butter in a saucepan and cook the onion and garlic for 5 minutes until softened. Stir in the rice and sage and cook for 30 seconds. Add the wine, bring to a simmer and cook for 2 minutes. 3. Add the rice mixture to the ovenproof dish and pour over the hot stock. Bake uncovered for 40-45 minutes until the rice is tender and the stock absorbed. Scatter over the cheese and divide between 4 bowls and finish with a good grinding of black pepper. For a stylish garnish, shallow-fry whole sage leaves in olive oil until crisp. Scatter them on the risotto just before serving.